Derek Jacobi, Patrick Stewart, Eric Porter and Claire Bloom star in Shakespeare's tragedy about Hamlet, a prince distraught by the hasty marriage of his Uncle Claudius to his newly widowed mother. The ghost of Hamlet's father visits his son, reveals that he was murdered by Claudius and entreats Hamlet to set things right. 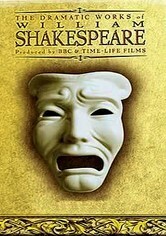 Shaken, Hamlet devises a complex plan to prove Claudius's guilt, but the choices he makes result in multiple tragedies.